Becoming a Feng Shui practitioner was a natural step for Catherine. Long interested in health and well-being, she knew she wanted to pursue a life focused on being of service. She earned a B.S. Degree in Sociology and Psychology at the University of North Carolina at Chapel Hill in 1975 and became a social worker. She received her Master of Social Work Degree from UNC-CH ten years later. Catherine moved to Boulder, Colorado in the mid '80's where she was introduced to holistic healing methods including Chi Kung medical practices and acupuncture. As a result, she became a certified Chi Kung Healing Touch Practitioner. Catherine with HH Grandmaster Lin-Yun, Khadro Crystal Chu, and Dr. Lien Nguyen. 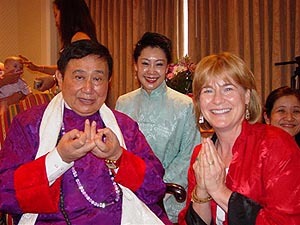 Catherine first heard about Feng Shui in the early '90's and in 1995 she began studying the teachings of His Holiness Professor Lin Yun Rinpoche, Grandmaster of Black Sect Tantric Buddhist Feng Shui. She soon became a student and disciple of Grandmaster Lin Yun. Along with her yearly studies with Grandmaster Lin Yun, whom she sponsored for a workshop in Boulder in June, 2004, Catherine completed four years of mentoring in Katherine Metz's Art of Placement program. Katherine Metz is a highly respected teacher, mentor and practitioner who has been studying with Professor Lin for more than 20 years. Catherine also had the good fortune of traveling and studying for three weeks in China with Grandmaster Lin Yun and fellow students in April, 2004. Catherine offers Feng Shui consultations to individuals and businesses throughout the U.S. and internationally. She is a professional member of the National Qigong (Chi Kung)* USA Association and of the International Feng Shui Guild. In addition to her International Feng Shui Consulting work, Catherine offers a mentoring program for students interested in learning more about Feng Shui. Her students go beyond the basics of this ancient art to gain a deeper understanding of the wisdom and compassion at the heart of Black Sect Tantric Buddhist Feng Shui. Catherine also teaches regular classes in the Boulder area as well as other locations throughout Colorado and the U.S.